LOCATION: Located is one of the most pristine and upscale areas in suburban Chicago, this restaurant and bar with real estate features a large outside patio with magnificent views of gentle rolling hills, forests and a small lake. Know for its American comfort fare at reasonable prices, this restaurant and bar has operated nearly 24 years in the same location, making it the place the community comes to meet friends and neighbors and to simply watch the game in the bar area. Located on an intersection of two major roads just on top of a small hill, the nearly 2.5 acre land has 109 parking spaces, surrounded by technology businesses with many employees, making for both great lunch and dinner traffic. This family restaurant is known for their burgers, but this broker loved how cold the beer was – ICE!!! This certainly is the place where the community comes to eat, meet and simply have a good time watching games and eating great food, how else could this business make it 24 years? FULL LIQUOR: The restaurant and bar serves full liquor. The bar area is separate from the dining area, making it cozy to warm-up next to the fireplace. There is a banquet room for those special parties that are always in demand in this upscale neighborhood. THE BUILDING: The building is in excellent condition with 4,200 Sq. Ft. on the first level with seating for 170 patrons inside plus a large patio with magnificent views seating 90 patrons. There is a basement as well as an upstairs area. THE BASEMENT: Down in the basement there is dry and liquor storage as well as three walk-ins (2 coolers and 1 freezer) including one beer cooler with a glycol system. UPSTAIRS: The upstairs contains offices, an employee room and the bonus is there is a large area that clearly was envisioned to be a small apartment at one time and I'm sure still can be converted to one. Recipes, Name and Brand to be licensed for this location. DEMOGRAPHICS: Household income within 3 miles is nearly $100,000 with a population of nearly 60,000 residence with a payroll of over $1.3 billion and over 2,000 businesses! PROFITS - 2017 Annual Revenues were $2,263,000 with Pre-Debt Working Owner Cash Flow or Free Cash Flow (FCF) of $408,000. Pre-Debt EBITDA in 2017 was $328,000. (Note: WOCF or EBITDA doesn't include mortgage payment of rent paid to one's self.) 2018 is on-track for about the same results. REAL ESTATE VALUE: Using 8% as the industry rent factor this restaurant could pay $181,000 in annual rent and still make a healthy profit. The net rent to an investor would be $140,000 after real estates taxes ($34,000), insurance ($8,000) and operating costs. Using a Cap Rate of 6% (The Property is in a Great Location and in Great Shape) gives the property a value of nearly $2.3 million. BUSINESS VALUE: 2017 Working Owner Cash Flow after rent is $270,000 (Assuming Buyer pays themselves a net rent of $140,000). This business has operated for nearly 24 years, has solid tax returns, is located in a AAA location in an upscale neighborhood with limited competition, and is absentee operated. Using a multiple of 2.5 gives the business a value of nearly $700,000 with a total value with real estate of $3,000,000. But we're selling it for $2,800,000! 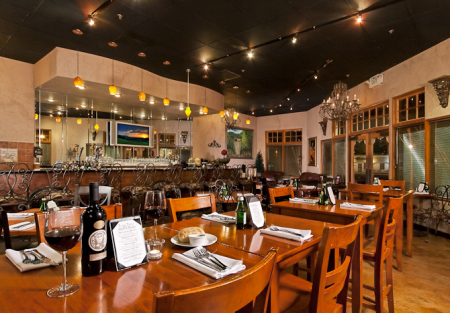 SBA LOAN: This restaurant and real estate easily qualifies for an SBA loan for a qualified buyers. With 20% down or $560,000 the annual principle and interest payments is about $173,000 leaving the working owner with $235,000 of free cash flow. That's a 25 year loan at 6.5%. OPERATIONS & OPPORTUNITY: 2017 Food costs run 30% while fully loaded labor costs are running 31.3% without General Manager. This broker believes there is plenty of room to raise prices 5-10% on most items, adding as much as another $150,000+ to cash flow. Lot Size 107,440 Sq. Ft.